There is a good reason to add a pair of image enhancement Tweeters upfront connected to an attenuator which is to improve the distribution of the highs and to fuse those highs into the overall sound. This image enhancement system will bring the highs and stereo image sound stage level to where the drivers head sits. No more playing for your legs. Many auto-sound systems cannot ideally provide for a convenient ideal mounting position. In some cases the Tweeters may need to be mounted well below ear level. In order to embellish the extreme top end and to lift the image (usually toward the windshield area) the Image Enhancement kit can add a dash of ³air² and space to enable the best overall special character. Mounts a pair of high-energy super Tweeters as far forward as possible, cross-fired up above the dash preferable up high on the A-pillars for best result) the higher up the better and therefore the windshield guides and controls the sound field. The guiding process provides an "acoustic ground-plane" for the Tweeters. This provides a raised frontal listening position and optimally long reverberation times. This silk Tweeter is a touch sweeter and less critical than metal dome Tweeters. The driver is cooled by ferrofluid Neodymium magnet including surface and flush mounts. Mounts a pair of CDT's top of the line high-energy audiophile Tweeters as far forward as possible, cross-fired up on the windshield glass upper corners firing at 45 degree angle for best result) the higher up the better and therefore the windshield guides and controls the sound field. The guiding process provides an "acoustic ground-plane" for the Tweeters. This provides a raised frontal listening position and optimally long reverberation times. This IEK-100i silk dome Tweeter has a sweet smooth sound. This tweeter is CDT's top of the line DRT-26 1" tweeter deriver housed in a cup that mounts right on-to the windshield glass. No drilling or cutting, a quick and easy installation. 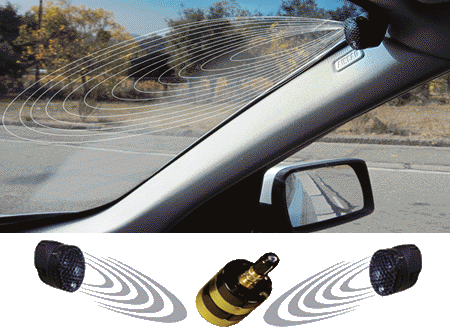 3M has developed a special double stick adhesive for these tweets to be mounted right on-to the windshield glass. The driver is cooled by ferrofluid Neodymium magnet including surface and flush mounts.